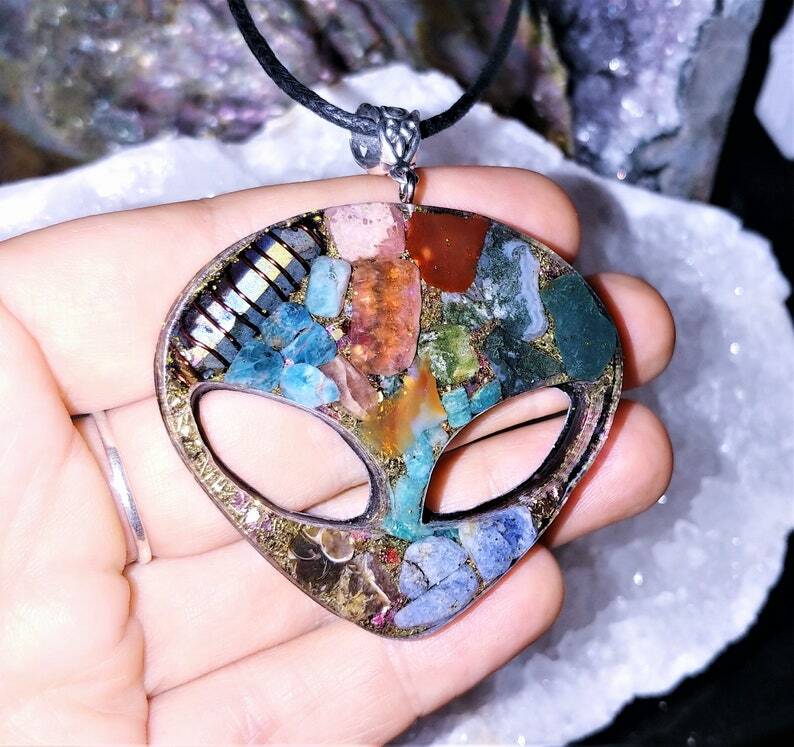 This Alien Orgone pendant is made for those who resonate with any ET race. I do believe that each and every one of us has alien DNA as a part of our genetic makeup. I often listen to channellings from different beings and wanted to create an Alien Orgone Pendant for a long time. So here it is! This particular Orgone necklace was made to aid the Throat and Heart Chakra centers. Use this pendant as a tool to align the energies of the bodily chakras and bring them into an equal alignment. You may work with the pendant consciously, or receive passive healing just from wearing it. All the crystals will be programmed to bring love, happiness, success and light into your life - I do it before the resin hardens, so the charge will remain, and will work for your good. Using positive Intent helps to direct this Source Energy towards personal healing, protection and spiritual awakening. This pendant was treated to vibration of Love and Light ~ 528 hz~ while curing. It contains Rainbow Aura Quartz wrapped in copper wire, Sodalite, Blue Apatite, Rhodochrosite, Turritella Agate, Moss Agate, Carnelian, Shungite powder, Pyrite sand, copper coils, mica, 24 k gold leaf, tesla coil, red copper coils metal shavings, Reiki healing energy, Love and Light, 528 Hz frequency. I make devices for those seeking to raise their vibrational frequencies and connect with their higher-selves. ALL HANDMADE, ALL MADE WITH LOVE. Carnelian is a stone of creativity, individuality and courage. Like all agates, it has protection energies. It can aid memory, including recall of past lives. It can assist one in finding the right mate. It is also a stone of protection in general and from anger, jealousy and fear. In addition it can help with manifestation of one's desires, and brings good luck. Carnelian can help ease or remove sorrows. It also helps stabilize energies in the home. It is sometimes called the "actor's stone". Carnelian is associated with the root and sacral chakras. It is strong stone to aid the physical body, as it maintains an improved flow of life force energy via the blood. The vibration of this bright orange stone, will accelerate your motivation, and aid you to clarify your goals, so you can find your best direction in life. This power stone stimulates ambition and drive, so it will aid you in manifesting what you require to move onto your desired path forward in life. It aids moving forward on a new life path, and will aid you to make new, clearer decisions and better future career choices. Sodalite stone has a strong vibration that is particularly helpful to aid the development of psychic abilities and with developing intuition. This stone may help you if you are doing public speaking and is excellent to aid communication generally. It has strong metaphysical properties that may stimulate latent creative abilities and it aids teachers, writers and students to understand the deeper philosophical principles. It will bring your attention to the qualities of idealism and truth and its energy may stimulate you to live up to your own ideals and ideas, about the nature of truth. This is a strong third eye chakra and throat chakra stone that brings an excellent energy into your life. Within the third eye chakra area is where the pineal gland is located. To assist with the development of psychic gifts, working within the third eye with Sodalite stone has a strong ability to accelerate the process. It will aid you to develop your intuition, and it will also stimulate the birth of clairvoyant abilities, or strengthen them if you already are using these gifts. This stone has a vibration that aids truth, and helps you to better understand the life you are living, and how you came to be in the situation in which you find yourself. Turritella Agate is a spiritual crystal, deeply connected to the earth and home, to one's personal roots and ancestry, even the events of one's past. It is a survival stone, one of strength and protection. Ancient life held within its form lends the power of wisdom and healing. As a record keeper crystal, it may be used to gain access to the wisdom of past worlds and past life recall. Gazing into Turritella Agate provides an excellent meditative focus to induce a trance state. Apatite is a stone that mystically can stimulate the thoughts and ideas. It is used, often in conjunction with meditation, to increase intellect, imagination, and intuitive and psychic awareness. It is said to help you maintain focus, learn, concentrate effectively, think clearly, and communicate better. Apatite is a powerful meditation or psychic awareness tool. It can clear the aura, enable spiritual attunement, and bring powerful psychic awareness. Apatite is used very successfully mystically for lucid dreaming, deep meditation, astral travel, past life work, rebirthing, and inner wisdom. It is a stone that promotes psychic communication, clairvoyance, and clairaudience. Apatite can be used to enhance the energies of other crystals and stones. Apatite is used by artists and others who wish to have more creativity in their lives to increase their creativity and imagination. Having apatite near you or wearing it can bring harmony on all levels, and brings inner peace. This occurs because it is aid to help release old feelings that may be hampering you in current life, including ones from past lives. Apatite is primarily related to the throat and third eye chakras. Moss agate is said to bring general abundance, success, and prosperity. It is also said to help one gain peace with extreme or excessive duties in life and brings self-confidence and higher self-esteem. Moss agate is also said to be a metaphysically protective stone. It is said to reduce the difficulties associated with overcoming addictive behaviors. Moss agate is associated with the heart chakra, which indicates stone of compatibility and friendship. Green moss agate is said to assist in finding hidden treasure, and be a stone of prosperity. It is known for its ability of grounding excess spiritual energy, down through the base and earth chakra to Mother Gaia. It resonates a lovely heart based vibration, that most of you will find useful to have in your life. It has balanced enduring energy and grounding ability, with sound metaphysical properties that are known to aid abundance and prosperity and stimulate creativity.